Many a Year ago I wrote about the biggest upsets in football vs rugby in terms of world rankings. In rugby it was 15 places while football 120 places in world ranking position. Today I have been looking at the rankings once again. This time I was looking into the highest position held vs the lowest position in the world rankings. The data again shows significant differences between the two sports. In Rugby teams move a lot less with New Zealand never being worse than 3rd in the world. By contrast Brazil and Germany have both been as low as 22nd at their worst. This shows their is less of a gap between top international football teams than rugby. If you look at the biggest movers you will also a difference between the sports. My own country Wales rose from 117th in the world to 8th in 2016. This is a crazy change, especially compared to the biggest jump in Rugby which was by Zimbabwe who went from 57 to 25th. 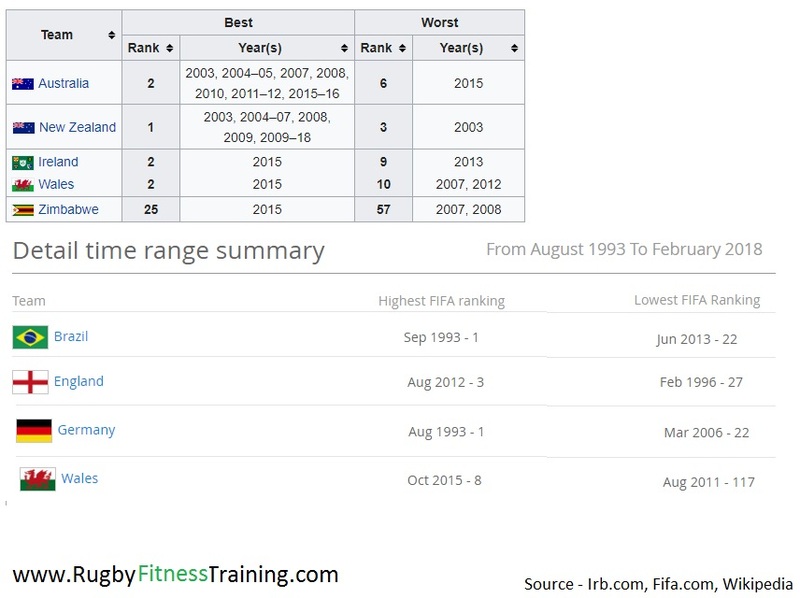 However, 25th is hardly cracking into the elite tier like Wales did in the football. The reason this difference exists in the sports is one part because of the popularity of football across so many more countries. However, the main reason is the simple demands of Rugby Union. It is like a martial art. A stronger, faster and fitter player will ALWAYS beat his weaker, slower and less fit opponent. There is no way around this. In football you can ride your luck, in rugby you can only ride your luck if you are in a ball park of your opponents physical abilities. So to get better as a country you have to create a culture where strong athletes want to dedicate time to becoming fit and fast under the banner of rugby union. To do this you need time, facilities and player numbers. All of these penalise lesser countries and play a big role in why the rankings in rugby show much less variability compared to football. So you may not be a professional rugby coach or player but this applies to any rugby player. If you are in division 4 there is a physical gulf in class compared to division 1. It can only be bridged by you taking your fitness up to the standard of the higher divisions. For coaches this means taking your overall team’s physicality to match division 1 level. You can do this by training your players over a few years to get there or getting new ones already at that level. This is the harsh reality of Rugby Union. You can practice your skills all day long but they will only ever work on someone who is in touching distance of your physical powers. For support, training plans or simply to ask a question please contact me.